Oral health if not maintained properly can lead to many other systemic diseases is what we have been seeing in many studies so far and here is yet another study which proves that Poor Oral or Periodontal health in particular can result in worsening of Rheumatoid arthritis. The study conducted by Researchers from the University of Louisville have found that poor oral health or in particular Gingival or Gum disease can lead to Rheumatoid Arthritis which is an Auto immune disease where one’s own body attacks itself due to the presence of enzymes which are seen as foreign bodies or a threat. In rheumatoid arthritis the patient suffers with swollen and painful joints. In this case there is an enzyme which is released in people with gum disease called “peptidylarginine deiminanse” which is seen to be associated with rheumatoid arthritis as well. The enzyme in question is the main reason because the peptidylarginine deiminanse enzyme transforms certain enzymes in the body into a protein called as “citrulline” which is confused by the human body as a harmful protein and is attacked which leads to the presence of inflammation and pain which is considered as an Autoimmune condition. This protein citrulline is seen in patients suffering from auto immune diseases like rheumatoid arthritis as well which leads to inflammation. With this study in mind there have been many studies relating to most of the patients suffering from rheumatoid arthritis having Gum diseases. The importance of the enzyme on rheumatoid arthritis was confirmed only after all the other bacteria which are present in gum diseases were ruled out of having any involvement in rheumatoid arthritis. 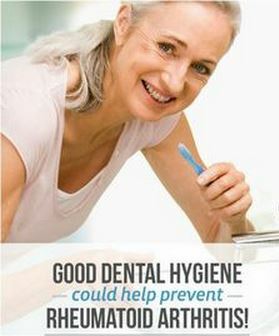 There have been many studies which have shown the correlation between gum disease and a higher risk of many systemic diseases like stroke, Alzheimer’s disease, diabetes, heart disease and various other health problems and with this study RA is also one such disease which can be aggravated by the presence of gum diseases and for patients suffering from this disease should maintain good oral hygiene and make regular visits to Dentists.